Do you wish you knew how to cook white rice that actually turns out good? With these cooking white rice tips, you can! White rice is something we tend to eat a lot of. It’s cheap and quick to make with very little prep work. Add some butter and salt and it’s a great simple side dish. Or, my favorite way to eat it, as a base to a variety of dishes from stir fry to ground beef stroganoff. 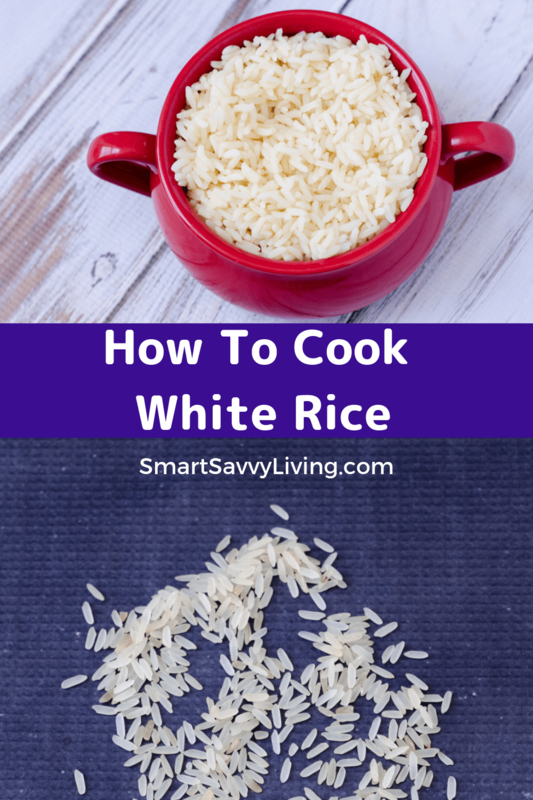 As simple as pouring water into a pot and adding rice and salt seems, cooking perfect white rice is a struggle for a lot of people. Maybe it’s still crunchy when you think it should be done or it’s so mushy it turns into a paste. Thankfully, how to make white rice is super easy when you follow these tips. What Kind Of Rice Are You Cooking? Growing up in a rural area back in the 90s all I knew was your regular long grain white rice. Then brown rice started catching on as it was thought to be healthier. Once I got into cooking more, I discovered there were all types of rice such as wild rice, basmati rice, and jasmine rice. The thing to note is that they all cook differently at various times. Today, our tutorial is for how to cook long-grain rice. 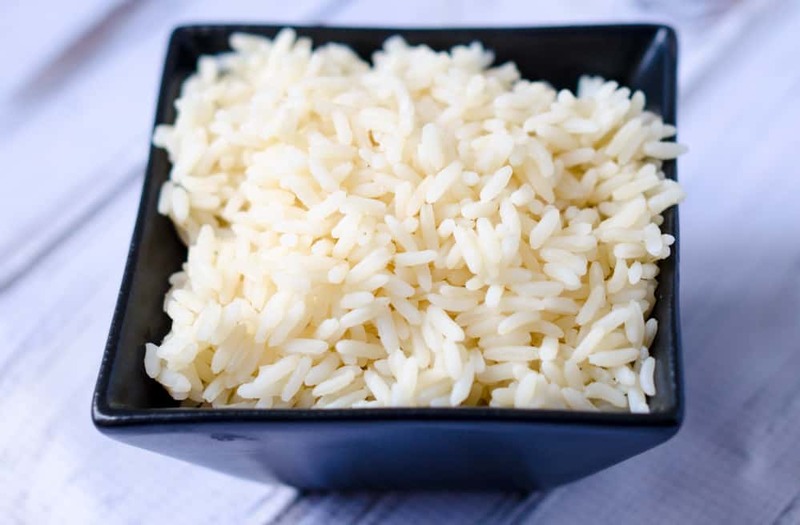 White rice generally triples in the amount when cooked. This means if you cook 2 cups of uncooked rice you’ll end up with about 6 cups of cooked rice. You also don’t want the water boiling over and creating a mess all over your stove. So, make sure the pot you’re using is big enough to hold everything without making a mess. 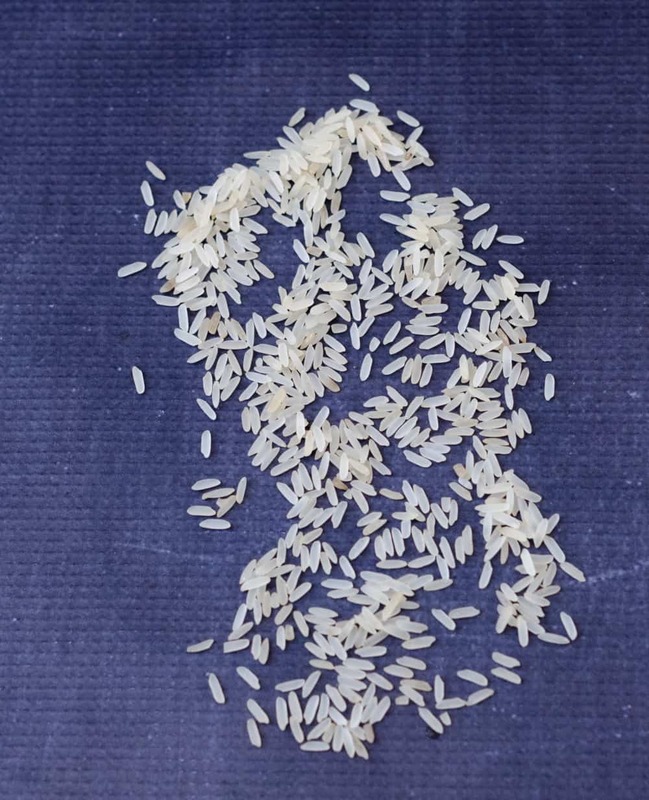 Should You Rinse Rice Before Cooking It? 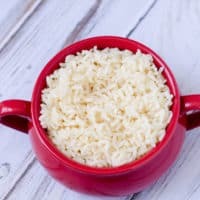 Some people like to rinse rice before cooking it as it supposedly removes excess starch and too much starch can make the rice too gluey/sticky. Rice used to also contain bugs, rocks, etc. which you’d want to wash out. That’s not something you really have to worry about with rice bought here in the states these days. Really, this depends on the type of rice you’re cooking. For regular long-grain white rice I don’t rinse it. Ultimately, I’d refer to the rice packaging to see if that particular brand recommends rinsing the rice first. If you’ve ever cooked rice from a boxed flavored mix, the directions may have told you to toast the rice before boiling it. When you’re cooking plain white rice, this is really an unnecessary step as toasting the rice is intended to add more flaovr. One of the most important things when you make white rice is the rice to water ratio. For long grain white rice you want a 1:2 rice to water ratio. This means if you want to cook 2 cups of uncooked rice, you’ll need 4 cups of liquid. Water is fine but if you’d like to boost the flavor a bit, consider using a broth or stock instead. I do suggest starting with rice amounts on the smaller side, 1 – 2 cups or so. I found that when I set out to perfect my rice cooking skills that I was more likely to screw up a large pot of rice. There are various ways to cook rice but if you want a pretty much fool-proof way to cook rice, consider investing in a rice cooker. As long as you follow the machine’s directions, you should end up with perfect rice that you don’t have to keep a watchful eye over. Simply wondering how to cook rice on the stove? While you do have to keep a watchful eye on the pot and clock, it really is easy to master. It’s my favorite way to cook rice though there are other methods we’ll talk about another day. 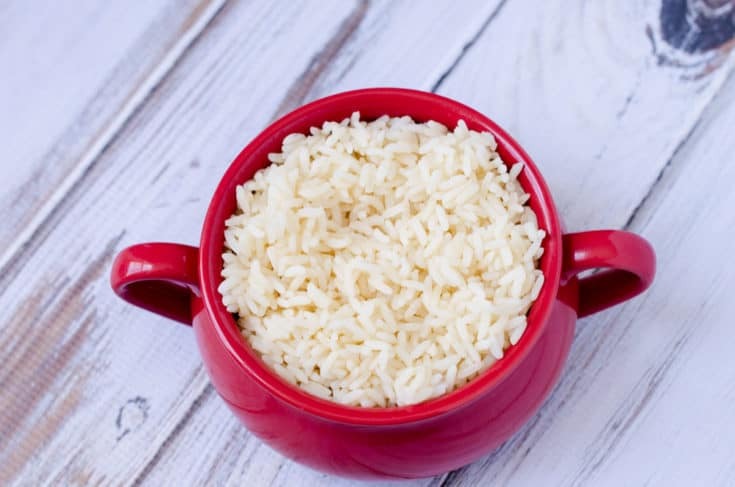 All you have to do is pick out your pot for cooking the rice, measure out the rice and put it into the pot (use a dry measuring cup), measure out the liquid and pour it into the pot (use a liquid measure), add some salt and butter if you like, give everything a stir, and turn the heat to high. Once the mixture has come to a boil, that’s a rolling boil with lots of fast popping bubbles and not a slow simmer, put on a lid and turn the heat to low. Then let the rice keep cooking for 20 minutes. The important part is DO NOT TAKE THE LID OFF THE POT during this 20 minutes. If you take the lid off, you release the steam taking away moisture and reducing the temperature. This can lead to underdone and unevenly cooked rice. Once the 20 minutes is up, take off the lid, and slightly tilt the pot to see if all the liquid has been absorbed. And really, if you used the correct amount of liquid at the right temperature and time there shouldn’t be any remaining liquid nor should it be burned. Then turn off the heat and put the lid back on the pot. If you use an electric stove you’ll want to move the pot to a cold burner so it doesn’t keep cooking as electric takes a while to cool down. Let the rice sit this way for 10 minutes. This helps the rice resorb some of the starches so it won’t be too sticky. After the 10 minutes, remove the lid and fluff the rice with a fork. This pretty much means just stir the rice with the fork to let any excess moisture trapped between the grains evaporate. Then the rice is ready to eat as you desire. Yum! If you have leftover rice, cover it well (such as in an air-tight container or ziptop bag) and put it in the refrigerator as soon as possible. If not covered well, the rice will become hard and dry. If it’s been left out more than 2 – 4 hours at room temperature it’s best to throw it away as it can grow bacteria quickly. Refrigerated rice should be used within 3 – 4 days. You sure can! Just pack into a freezer-safe container or heavy-duty freezer bag and freeze for up to 6 months. You can thaw it before heating or heat it straight from frozen. It’s a handy and much cheaper option than buying the frozen rice bags you can microwave from the store. Note that it’s not recommended to reheat rice more than once as bacteria can easily grow this way. Does the perfect white rice elude you? Find it with these tips! Place water, rice, and salt and butter if using into a medium-sized pot or saucepan over high heat and stir. Bring to a boil. Once boiling, cover the pot with a lid and reduce the heat to low. After 20 minutes, make sure the liquid has evaporated by removing the lid and tilting the pan to the side. Once the liquid has been absorbed, recover the pot, remove from the heat, and allow to sit 10 minutes. After 10 minutes, fluff the rice with a fork and serve. Nutrition data was provided and calculated by Nutritionix. Nutrition information isn't always accurate. Exact nutrition information depends on the specific ingredients you use.